How soon is the future coming? I recently attended a conference on Connected & Autonomous Vehicles, hosted by Herbert Smith Freehills, an international firm of solicitors located in the heart of the City of London and founded about 150 years ago. Some readers will be familiar with the graphic reproduced right, which is taken from the paper Connected and Autonomous Vehicles – The UK Economic Opportunity produced by KPMG and SMMT earlier this year. It refers to ‘levels’ of automation for cars. 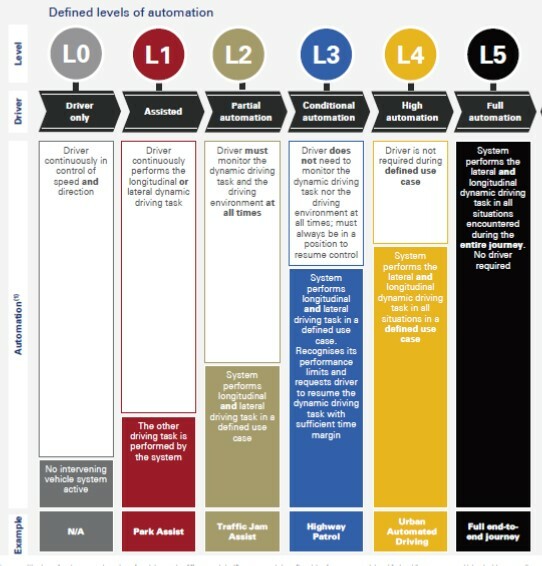 We are currently at Level 2 – partial automation – with such items as park assist (steering only), cruise control, adaptive cruise control, lane assist, collision avoidance, etc. Many ADIs are asking where this automation will go, how long before the driver is simply carried to his/her destination by a self-driving car? In my view, it will be a good few years before this dream or nightmare, according to your point of view, becomes a reality. Continue readingHow soon is the future coming?